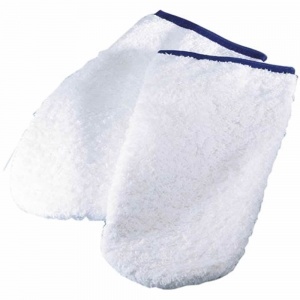 Cotton Mitts provide extra client comfort during paraffin heat therapy and luxury manicure treatments. These mitts can also be warmed in a hot towel cabinet to provide a warm, relaxing method of product removal in facial and body treatments. Can be used warm for a relaxing removal of facial & body products. Ideal for use in luxury manicure & paraffin heat therapy hand treatments. Helps to keep paraffin wax & hands warm, prolonging relaxation. Provides additional soothing warmth to ensure client comfort. Large size, can accommodate all hand sizes. Economic, due to their ability to be re-used after thoroughly washed.